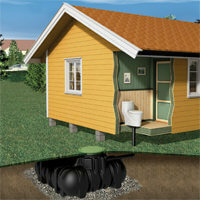 Our small wastewater treatment systems are already being used by 240,000 satisfied customers. GRAF wastewater tanks represent the state of the art. KLARO, our long-term wastewater treatment technology partner, has been part of the GRAF Group since 2014. When you buy a small wastewater treatment system from GRAF, you therefore benefit from the quality and expertise of two established brands in local wastewater disposal. Plastic material - clear advantages over concrete! How does a SBR wastewater treatment system work? Function of a SBR wastewater treatment system.